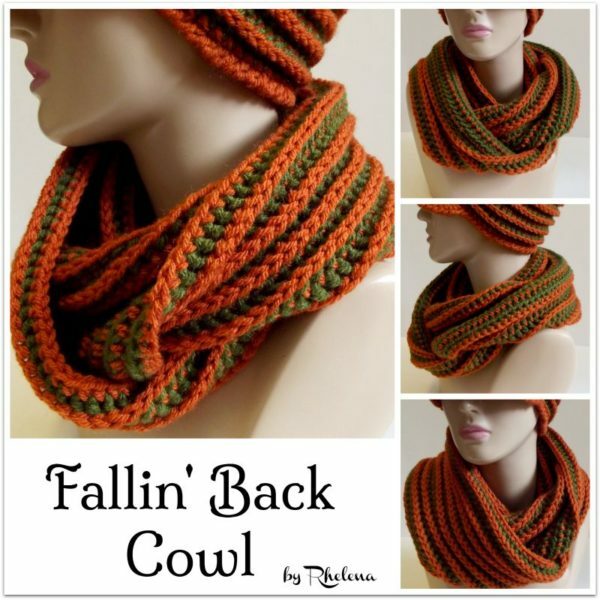 This cowl pattern works up quick and easy. It is crocheted up in two colors using the half double crochet and the back post double crochet. I crocheted mine in fall colors, but any colors would look great in this. It looks great on both sides so you could have lots of fun with color and texture if you want. And best of all, the stitch pattern is in any number of chains, so you could crochet this as long or as short as you want. That also means you can use any yarn that you like. I used Vanna’s Choice with an I hook and it makes for a nice solid cowl for the cold winter, or even the Canadian fall weather that we get sometimes. But if you want something with a bit more drape, you could use a finer yarn or larger hook. There is no right or wrong in crochet, which is why I love it so much. You can do whatever your little heart desires, as long as you like the outcome of it. This cowl has not been tested by anyone but me. It was so simple that I figured I could get away without it, but let me know if you find any errors. Thanks so much, and I hope you enjoy. Yarn: Vanna’s Choice (#4 medium worsted weight), Two 3.5oz balls, one of each color. Gauge: 2″ over 6 sts. Join new color in joining sl st of each rnd. Carry yarn up at each round. With CA, Ch 150, join with sl st being careful not to twist chs. Rnd 2: With CB, Ch 1, bphdc in same st as join and into each st around; with CA, join with sl st in first bphdc. Rnd 3: With CA, Ch 1, hdc in same st as join and into each st around; With CB, join with sl st in first hdc. Rnds 4-18: Rep rnds 2 & 3 ending with rnd 2. Rnd 19: With CA, ch 1, sc same st as join and into each st around; join with sl st in first sc. FO. And if you like, visit CPB for over 200 FREE Cowl & Infinity Scarves Crochet Patterns.